Who doesn’t love getting to sleep in an extra few minutes, skipping the shower, and sprinkling on some dry shampoo?? A lot of dry shampoos come in aerosol cans or plastic containers which aren’t super ideal when you’re trying to cut down on your waste. And, let’s be honest… the ingredients in drug store dry shampoo can be questionable. Here’s the ingredients from Dove’s dry shampoo. I’m assuming alcohol is high on the list because it’s drying and will help absorb grease, but alcohol really dries out your hair and can cause damage over an extended period of time. The other ingredient that always makes me wary is Fragrance. Fragrance is considered a trade secret… so you’re allowed to put anything in it and you’re not legally required to disclose what’s inside. Pretty crazy, right? Here’s more info from EWG Skin Deep on the product, if you’re curious. All of this to say, a lot of dry shampoos aren’t super great from a personal health standpoint or an environmental standpoint. And, to be honest, they’re not super good on the $$$ standpoint either. If you’re using dry shampoo (like I am) it can really add up! This DIY is easy, super inexpensive, and A-OK for you health and the health of the planet! After all, that’s what this blog is all about. Health of self - health of planet. I like to store my dry shampoo in a salt and pepper shaker for easy application. I just sprinkle the mixture straight onto my hair. If you’re looking for a little more control though, you can always use a makeup brush! Related: How to Clean Your Makeup Brushes. Sometimes, when you use dry shampoo, the powder can turn your hair slightly ashy. I don’t experience this problem, but if you know it’s a problem for you, I recommend sprinkling the mixture on your hair an inch or two away from your natural part. This mixture contains bentonite clay so it’s important to remember to use a wooden spoon so the clay isn’t deactivated! Bentonite Clay might seem like an odd ingredient but it’s highly absorbent and helps to draw oils away from the skin! So, don’t skip it. I hate when recipes call for random ingredients that you’re only going to use one time… but I promise you will find yourself reaching for Bentonite Clay again and again and again! You can use it in a DIY Healing Face Mask, Remineralizing Toothpowder, and even a finishing powder! For a recipe with a little more healing power to it, check out this one from my friend Alison at Wu Haus. However, if DIY is not you’re thing… here’s two dry shampoos with clean ingredients that come in recyclable and/or reusable packaging. La Tierra Sagrada and Captain Blankenship. Are you a dry shampoo fan? Have you tried your hand at DIYing it? After my cancer scare, I started my natural living journey. I turned to DIY not just because it felt safer, but also because it's cheaper. I like knowing exactly what's in my products, and I’m always down for saving my pennies! Plus, I think making zero waste makeup is a really fun challenge! This zero waste powder foundation is simple to make and simple to use! It’s definitely a finishing powder. It will absorb oil and even out your skin tone. It won’t leave you looking cakey. It’s not a heavy, thick foundation powder. In the morning, I use a tinted SPF* as my base. It’s pretty sheer, but I like knowing my face is protected from the sun. If I have any red bumps, I’ll put on a dot or two of concealer*, then I’ll dust my face with this light powder to even everything out! I have a birth mark on my left hand which you might have noticed in several videos and photos. I used my hand as an example because it was easier to take consistent photos by myself. I have a lot of pink in my skin which only accentuates any acne I may have. Using this powder helps smooth everything out and give the illusion of a nice even skin tone. The main ingredient is arrowroot can also be found in my zero waste deodorant recipe, and then there are a lot of different ingredients you can use to create a shade close to your skin tone. 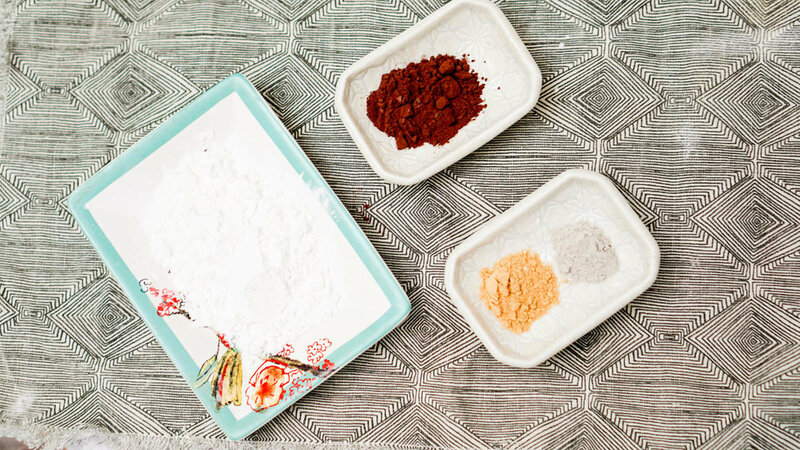 The other ingredients you can use to adopt any shade are cacoa powder, ginger, bentonite clay, French green clay, and cinnamon. You'll want to adjust all of these ingredients until you get your desired shade just right. Arrowroot: is great for the skin! It actually helps to clear acne. Yes, you can clear your acne while wearing this foundation. Arrowroot absorbs oils and sebum all while promoting natural healing. Organic cacoa powder: is loaded with antioxidants and is super high in vitamin C which means you’re fighting wrinkles, skin damage, and free radicals. Cacoa helps to darken the base. Ginger powder: has anti-bacterial properties to help unclog pores and kill acne-causing bacteria. Add more ginger for warmer skin tones. Bentonite clay: shows up in a lot of my recipes from face masks to toothpowder. It removes toxins from the pores, reduces inflammation, and lightens acne marks. It's great for cooler skin undertones. Remember don't use a metal spoon with clay or you'll deactivate it! Cinnamon: is a powerful antibacterial which can help reduce acne. However, it can really bother some people. I don't put cinnamon in my foundation because I find it to be irritating. Test patch a small place on your skin. It adds a great warm hue to the foundation. All of the ingredients were obtained in bulk from Berkeley Bowl and Oaktown Spice keeping this a totally zero waste DIY. I store my powder in an old powder tin. The powder is shelf stable and will last 9 months to a year. Have you tried making your own makeup?